DB Time is DB CPU plus Non-Idle Wait Time. 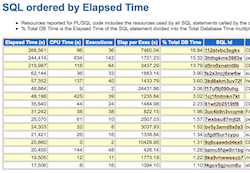 Remember that DB Time does not include background process CPU consumption and Oracle Corporation determines which wait events are considered idle. Pretty straightforward, eh? Below is a short video clip summarizing the key time parameters taken from the OraPub Online Institute seminar, Tuning Oracle Using an AWR Report - Part 2. If you can't see the video, click HERE watch it on YouTube. issues and that I could give away. The result is what I call the Oracle Real-Time Session Sampler (OSM: rss.sql). If you simply want to watch a video demo, watch below or click HERE. The key Oracle Database time parameters are elapsed time, database time (DB Time), non-idle wait time and server process CPU consumption (DB CPU) time. This first post is pretty basic, yet core fundamental stuff. So in the following two posts I'll introduce elapsed time, add parallelism into the mix and revisit wall time. What initially seems simple can some take very interesting twists! 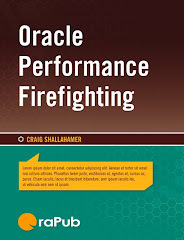 You probably know that I am all about quantitative Oracle performance analysis. I research, write, teach, and speak about it. I even have an OraPub Online Institute seminar about how to tune your Oracle Database systems from a standard AWR or Statspack report using an Oracle Time Based Analysis (OTBA) framework. I'll start with Wall Time because that is close (hopefully) to what a user experiences. In fact, if there is no time gap between the Oracle Database and the user, then we can do a little math and figure out what the users are, on average, experiencing. I'll get back to wall time in the next post, where I include elapsed time and parallelism into the equation. DB CPU is Oracle server/foreground/shadow process CPU consumption. 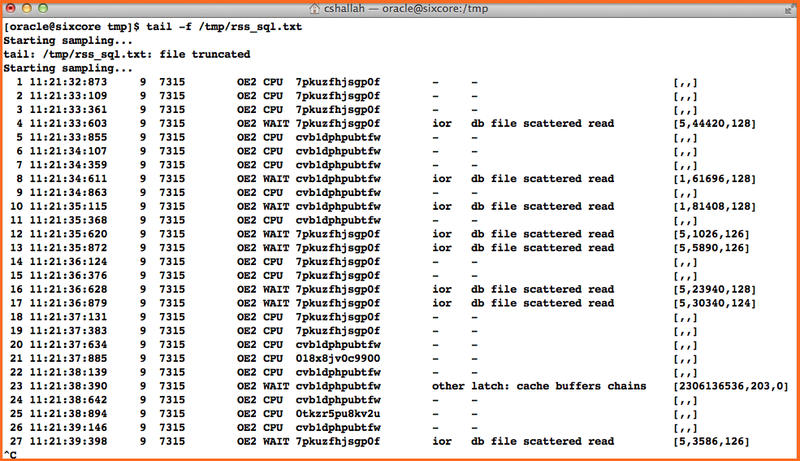 Each Oracle server process gathers its own CPU consumption using the time and/or getrusage C function system call. So unless there is a major screw-up by either the operating system or the Oracle kernel developers, the time will be good... very good. The name DB CPU is taken from the actual statistic name, which is found in both v$sess_time_model and v$sys_time_model. Below is an example Time Model Statistics screen shot from a standard AWR report. I've highlighted DB CPU. If you run one of my OraPub System Monitor (OSM) time related tools like ttpctx.sql or rtpctx.sql you see a CPU time statistic. That contains both the DB CPU (i.e., server process) and "background process cpu" statistics. Here's an example. 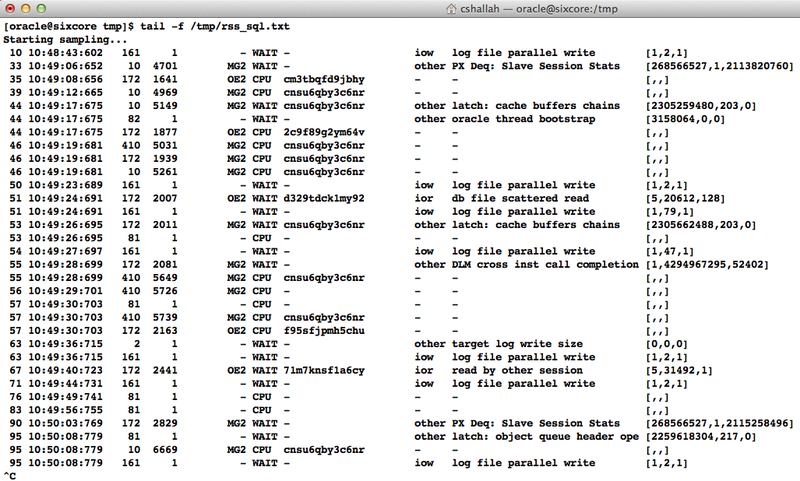 When an Oracle process can not consume CPU, it will pause. As an Oracle DBA, we know this as wait time. Sometimes a process waits and it's not a performance problem, so we call this Idle Wait Time. Oracle background processes typically have lots of idle wait time. However, when a user is waiting for sometime to complete and way down deep their Oracle server process is waiting to get perhaps a lock or latch, this is Non-Idle Wait Time. Obviously, when tuning Oracle we care a lot about non-idle wait time. 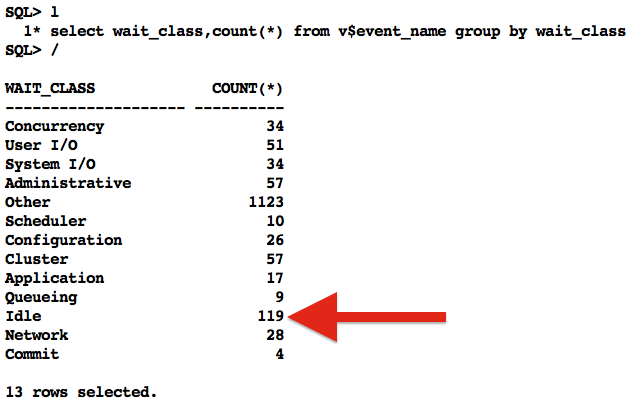 Below is a simple query showing wait event classifications. In this system there are 119 Idle wait events, so all the rest would be classified as non-idle wait events. Oracle uses a variety of methods to determine wait time. I have a number of postings and educational content available about this. You'll see them if you do an OraPub or blog search for "time". When working with non-idle wait time, remember the 80/20 rule. Most of the wait time we care about will be contained with in the largest ("top") two to four wait events. Don't waste YOUR time focusing on the 20%. Here's an example. In the screen shot below, while not shown the total wait time is 1966 seconds. If you add up the displayed "top" four wait events, their combined wait time is 1857. This is about 95% of all the non-idle wait time. This is a good example demonstrating that most of the wait time is found in the top two to four events. My OSM toolkit has many wait time related tools. Most start with "sw" for "session wait" but the both ttpctx.sql or rtpctx.sql will contain the non-idle wait time and also CPU consumption. This is a good time to transition into DB Time. DB Time is a time model statistic that is the sum of Oracle process CPU consumption and non-idle wait time. When optimizing Oracle systems we typically focus on reducing "time", though many times database work is also part of the equation. This "time" is essentially DB Time, though sometimes I take control over what I consider idle wait time. The name DB Time comes from the actual statistic name in both v$sess_time_model and v$sys_time_model. If you look at any AWR or Statspack report in the "Time Model" section, you will see DB Time. The DB time value is technically all server process CPU consumption plus the non-idle wait time within the reporting snapshot interval, converted to seconds. (The raw statistic is stored in microseconds.) 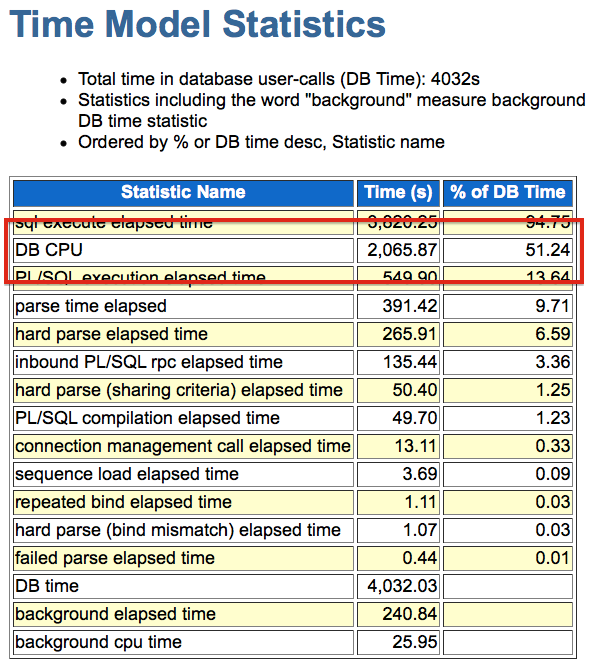 Surprisingly, Oracle does not include "background cpu time" in the DB Time statistic. There are both good and not so good reasons the background CPU time is not include, but that's a topic for another posting. We have enough detail to relate DB Time, DB CPU and non-idle wait time together... using a little math. This is important, because there is no single statistic that shows all the non-idle wait time. This must be derived. Shown above is one way to derive the non-idle wait time. Take a look at the AWR report snippet below. I wanted to keep this post short, which means I left out the more interesting topics. So in the next post I'll merge into the picture elapsed time along with parallelism and revisit wall time. Then in the third post (that's my guess at this point), I'll actually demonstrate this in two different systems.